-Centre Horizon. Quebec City, Quebec, Canada. August 16, 2014. -Is there a reason everyone always says both the province and the country when billing wrestlers from Canada? Or maybe the better question is why don’t we do that with our states in America? -Quebec is actually pronounced like the “Qu” is a “K.” I learned that from a Canadian. -Permis De Tuer is the French version of License to Kill. -Did they only sell twenty tickets to this show? The crowd isn’t even two deep around the ring! -So, Chikara’s never coming back to Quebec… Check. -I’m saving myself the half hour figuring out match lengths. If that’s important to you, Cagematch and the Internet Wrestling Database are the sites I used. The show starts with the elimination four-way that seems to be their calling card these days. Does Vegas take bets on Chikara? I don’t care what the odds are. Put your money down on the Odditorium getting knocked out first. Stefan and Ivan rock the heck out of their overalls, flannel, and camo baseball caps. If there is such a thing as a Canadian hick, that’s what they are going for. The Sullivans were eliminated next by an Ophidian Meteora. These Canadian, less racist Briscoes are welcome back any time. There were a lot of redundancies in that sentence, weren’t there? Is there a Canadian version of something that’s more racist? And is anyone more racist than the Briscoes? Business really picked up when the Osirian Portal and Spectral Envoy squared off. I suppose that’s what you get with four guys who have been competing with and against each other for almost a decade. The Portal won with the Osirian Sacrament to Hallowicked and departed with two points and a handshake. Sportsmanship! Seriously, though, there’s not even a hundred people in the crowd. Remington admires a fake plant before cutting a promo involving dumpster diving, Jimmy Stewart, and a reaffirming life message. This guy is a national treasure. Unfortunately, though, it seemed like his ladyfriends had Visa issues. Kodama, sans Obariyon all weekend, was a good choice for Remington. First, it allowed us to see Remington’s (more) serious side. Second, we got to see what it would look like for Kodama to learn gun fingas. Overall, we got a pretty solid match. Kodama doesn’t have the effortless chemistry with Remington that Chuck Taylor or Archibald Peck does, but it was nice to see Remington go without having to rely on his shtick. Remington won with Anchors Aweigh. 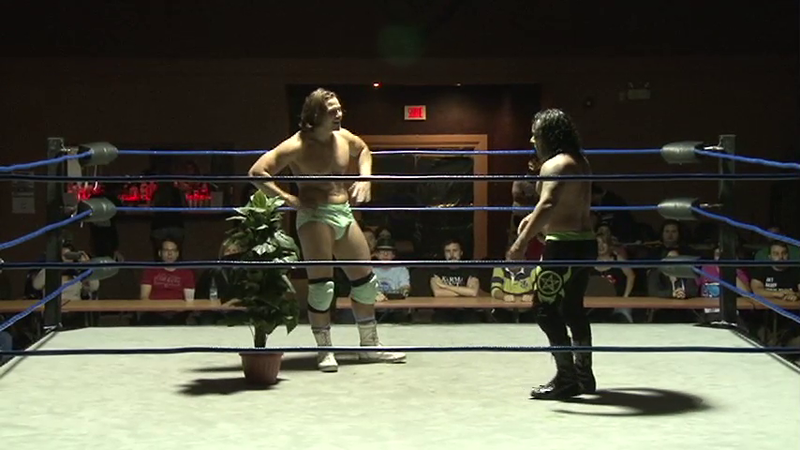 After the match, Remington gave Kodama the fake plant from his promo and Kodama reciprocated with a bag full of something that made Remington cringe towards the audience. Where does the Bloc Party fit in with the Chikara vs. Flood feud? Are they neutral rudos? It’d be nice for them to get worked into this somehow. In any case, Hoss Alert! Silver Ant used his technical skill to cut Boar down to size before Boar hossed up and threw Ant around for a while. Silver Ant made the comeback and won with a frog splash, which seemed to win the crowd some prizes. This was a good match, as if Silver Ant is capable of being involved in anything else. Silver Ant winning was the right call. Proletariat Boar is not at his level and there was no distracting hatred ala Missile Assault Ant to provide an excuse. Best still, Boar got to hang with Silver for a while and looked good in defeat. This impromptu match began with a Jimmy Jacobs promo. He rubbed the death of Estonian Thunderfrog in the crowd’s faces before saying that as the Flood thinned Chikara’s ranks, they must thin their own. Jacobs blamed the Shard for losing the Campeonatos de Parejas and weakening the Flood. Kingston was brought out, sans music, to punish Shard for failing to meet expectations. Kingston was immediately reminded that those who exceed expectations are rewarded. The good news for Chikara is that logic is not the Flood’s strong suit. After slumming it with Shynron and injured Jervis Cottonbelly, Kingston finally got some good competition. Kingston wasn’t moping around like he had earlier in the season, but his heart wasn’t completely in it either. Jacobs taunted Kingston with the Grand Championship and told Shard to break Kingston’s ankle if he wanted. That woke up Kingston. Deucalion, 17, and Nøkken came out as Kingston hit a Sliding D and three Backfists to the Future. Meanwhile, Icarus ran out and attacked the Flood while Bryce disqualified Kingston for excessive punishment. Kodama, Lithuanian Snow Troll, and Latvian Proud Oak also ran in to avenge their deceased partners. The Flood gained control, sending Icarus and Kodama packing. Kingston made Snow Troll watch as Deucalion murdered Latvian Proud Oak with a Chokebreaker. Deucalion took out a leash and tossed the end to Snow Troll, who preferred a life of servitude to certain death. Jacobs leads Snow Troll to the back as the camera pans back into the ring. This was a HUGE segment! Eddie Kingston joined the Flood and Lithuanian Snow Troll was added to the Flood’s collection of POWs, where he will join Delirious and Soldier Ant until they are given something to do. As big as this segment was, there were some major issues. First, again, where was Chikara as their friend was getting executed? The Colony, the Throwbacks, Scott Parker, and Archibald Peck (Whoa, meta!) mourned Proud Oak’s death, but none of them could be bothered to attempt to prevent it. It’s not like we don’t know what’s going to happen when Deucalion shows up. Second, there was too much going on. Things got really sloppy, which took away from the power of Eddie Kingston giving in and joining the Flood. Third, nothing Jacobs said to Kingston was any different than anything he said before. There was no switch flipped. No “ah-ha” moment. There was no indication that Kingston had reached a turning point. Just “Very well. I am a Flood now.” Kingston is the most interesting part of this story, but we hit his climax without any indication that something important had happened. So, this was important stuff, but the confusion and a crowd more interested in making jokes sucked the power right out of what should have been an incredible moment. The crowd sings The Bodyguard as Proud Oak is carried out. They were not taking this story seriously and they were not the only ones to do so this season. That’s a problem for Chikara. Jagged cuts a seemingly standard “This is a war!” promo until he mentions that they are near the site of the Battle of the Plains of Abraham. Did Parker just reference the decisive battle of the Seven Years War’s North American Theater? Swoon! 3.0 unleashed all of their double team moves before Xtreme Force took over with two big boots. Missile Assault Ant continues to be impressive, particularly with some crisp European uppercuts and a trio of northern lights suplexes that he rolls right through. Have I made a Very Mysterious Ant joke already this season? 3.0 wrestled the momentum away and Parker leapt off the second rope for the Sweet Taste of Professionalism. A nice match and point number two for 3.0. We’ll see if Jacobs and Deucalion toss Xtreme Force into the shark tank for their failure. Juan Francisco cut a wonderful promo in which he related an Ecuadorian legend where the Ecuadorian Prime Minster would feed band geeks to the lions. In case you are curious, Ecuador has never had a prime minister. Mike Quackenbush apparently created a three-point system for the Grand Championship as well. De Coronado is at three points, which would reset with a loss tonight. Peck embarrassed De Coronado until he sent Peck on a nasty apron spill and worked over his knee for a while. Peck eventually hit a Cranial Crescendo, but his knee was too hurt for him to capitalize. De Coronado bafflingly risked disqualification for a flag shot and then randomly waved the flag until Peck took him out. The Flood attacked Chikara to start, as they have done in every main event this season. 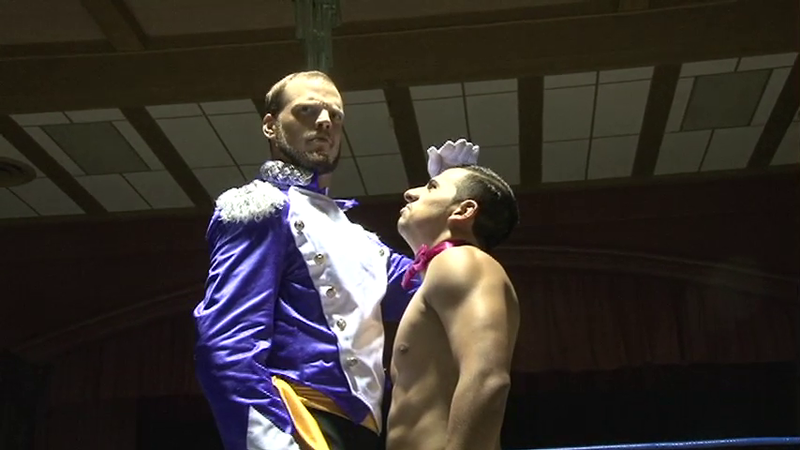 At some point, Chikara forces just deserve a beating. The Flood wore down Worker Ant and Touchdown until Dasher got so angry he attacked the entire Flood team, allowing Icarus to pull Angelosetti out of the ring. Dasher has quietly become the company’s best storyteller. No one has exuded the passion and anger this rivalry deserves as well as Dasher. The Flood isolated Dasher next, taunting the tecnicos and giving the Flood the opportunity to gang up with Bryce Remsburg distracted. This great rudo work kept the crowd buzzing more than it had all night. Chikara forces finally fired back with finisher barrages and near finishes. Nøkken planted Icarus, but Jacobs called Nøkken off so he could finish him himself. Predictably, Icarus persevered and the Throwbacks connected with Prime Time to 17 for the win. Chikara celebrated after coming together to avenge the murder that they put no effort into preventing. Go, Chikara! Still, this was probably the MATCH OF THE EVENING! My only complaint is that Fire Ant barely got into that match at all. He stepped in for a wheelbarrow stunner, got speared, and took the Devastation Corporation out with a dive. That guy is the hottest (har!) tag in the company and they couldn’t find a spot for him? 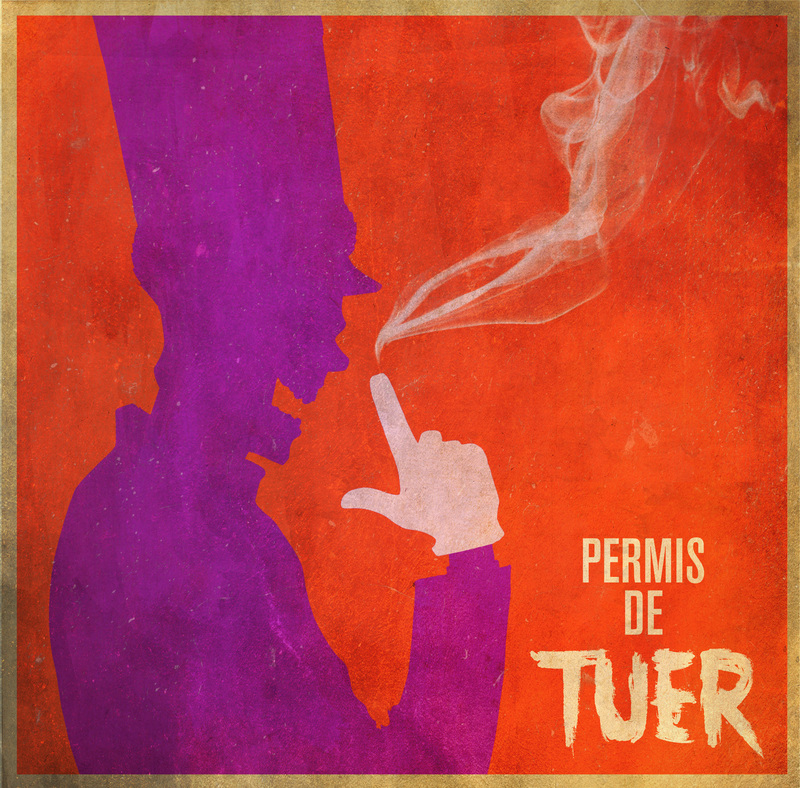 “Permis De Tuer” was a solid show. Sadly, that seems like a disappointment for a show so important. The huge moment that we all should be writing home about was sloppily done and confusing enough that it ended up not being anything to write home about. Next is “Vivre Et Laisser Mourir” from Montreal! “Vivier” needs to send us into King of Trios with a bang. For the Wrestling? Sure? There wasn’t a bad match on the card, but there weren’t any barnburners either. For the Story? I think important stuff happened with Eddie Kingston and Snow Troll. That segment was such a mess, however, that I’m not sure what it was. RIP Latvian Proud Oak (2013-2014) You were – Whoa, Peckception! This entry was posted in Professional Wrestling and tagged Ashley Remington, Canada, CHIKARA, Dasher Hatfield, Deucalion, Jimmy Jacobs, Latvian Proud Oak, Lithuanian Snow Troll, Permis De Tuer, Silver Ant by Rites of Patches. Bookmark the permalink.